Use the resources on this page to learn how to search for current job openings, register an online account, and fill out/submit the Amtrak job application. The application is available 100% online on the company’s main jobs site. The instructions posted below detail how to navigate the jobs site, view the list of current openings, and more. Numerous career types can be searched/applied for including mechanical, engineering, operations, security, corporate, and IT positions. About the Company: Amtrak is an American railroad service headquartered out of Washington D.C. The company is officially known as the National Railroad Passenger Corporation. Amtrak was founded in 1971 and serves more than 500 locations throughout the U.S. and Canada. 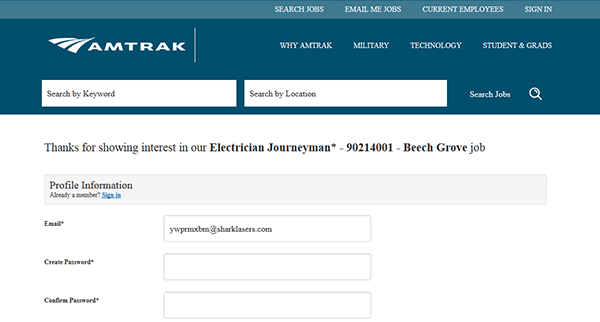 Step 1 – Click here to have the Amtrak main employment site load in a new tab/window. Note: you can also press the button/link at the top of this page to load the employment site in your current tab/window. 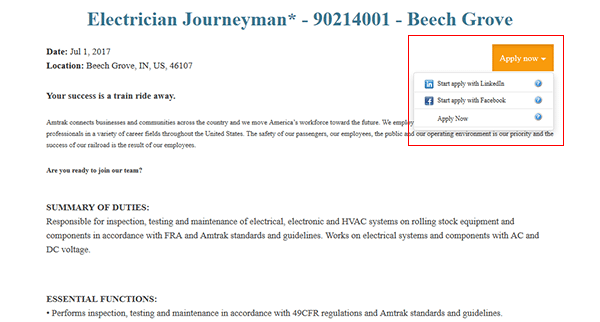 Step 2 – Click the “Search Jobs” link near the top of the page to go to the main search page. If you want to learn more about the different types of careers that are available, scroll down the main page for more information. Step 3 – Search the list of current openings by keyword or location. 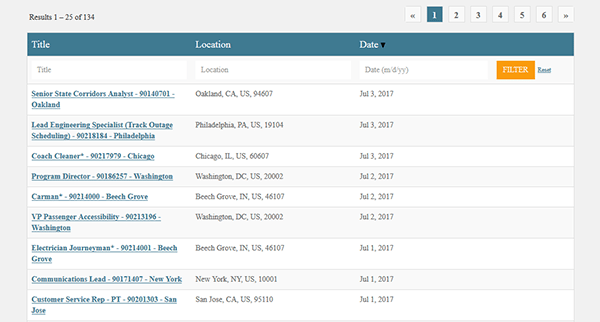 Step 4 – The results can be sorted by title, location, or date. Click the position link/title to go to the next step of the process. Step 5 – Review the description of the job, press the button as outlined below, and then select how you want to start the application process (if required, fill in your email address and then hit the “Start” button). Step 7 – Complete all/any required sections/subsections of the form.